Christmas is coming early for phishing scam artists. The day after Halloween, my Inbox started filling up with alerts that I had won a $50 Amazon/Walmart/Costco Gift Card, packages I didn’t order began arriving from UPS/FedEx, LinkedIn change requests, and an assortment of other fanciful clickbait just begging to be clicked on. Many of us are smart enough not to be fooled into clicking on phishing emails but a recent survey found that those of us who know the dangers of phishing still can’t properly identify 50% of phishing emails that are sent. Even though surrounded by cyber-security day-in and day-out, one of our employees recently fell for a phishing scam for iTunes credentials. It wasn’t until their credentials failed to log them into the “iTunes” site and someone connected to their iCloud account that it dawned on them that they had been taken by a scam. Scammers are good and the reason why we continue to get emails from Nigerian princes and Nelson Mandela’s wife is that people still fall for the scams and cyber-criminals continue to make a profit. Hackers are gaining easy access to money, user credentials, and healthcare data through a variety of different phishing scams. And they are sending out an estimated 8 million emails a week. The City of El Paso had $3.2 million diverted through a whaling scam that sent legitimate vendor funds to the incorrect accounts. Bayside Healthcare potentially revealed the health records of 13,000 patients by having one of its employees fall for a phishing scheme. There is one simple step that everyone can take to defend themselves against phishing attempts: Hover over links in emails to see what site you are being directed to. Or even better yet, go directly to the vendor (Amazon, FedEx, banks, etc) to see if the offer or information is legit. Clicking on links directly from emails, even if they appear to be legit, carries risk. The email that lead to the hack of John Podesta’s email came from a site that had an address that looked like it was part of the Google Domain but really was not. Often I see emails that appear to be from banks with an odd misspelling (bankfoamerica.com or welllsfargo.com– Did you catch the problem?). Scammers have also been getting better at using proper English and grammar by hiring copywriters to make their emails more difficult to detect. For business owners, implement a system of checks-and-balances for sending funds to vendors or distributing sensitive employee information. Encourage your employees to question unusual and urgent requests for wiring money, even it comes from the highest levels of the company because fraudsters are posing as the CEO, CFO, or HR Director to try to trick your employees. Scammers take advantage of the whatever season it may be for soliciting for information. During tax season, they pretend to be the CEO or HR Director looking for employee W-2s. During the Christmas season, they send great sounding offers for gift cards and surprises from some of our favorite online stores to elicit information. So as the holiday shopping season is upon us, buyer beware… and buyer be wary. Scammers are out to get you and they are getting cleverer every day. Throughout history, women have been fighting for the ability to pursue their dreams and a major part in this pursuit has been the fight to be able to participate in the workforce. Women started heavily joining the workforce during 1954-1980; Currently, 57% of adult women are a part of the labor force, and that number continues to grow. While this shows great progress for women determined to have careers, the mathematical and technical industries are still heavily male-dominated. One industry that many are aware of this gender gap is I.T., with women only making up a mere 26% of the available positions. This statistic is surprising because the cyber-world itself is struggling to fill positions with qualified individuals. By 2020, it is predicted that there will be 1.4 million jobs available in computing-related fields, however, U.S. graduates are on track to fill only 29% of those jobs, with women filling just 3%. Though this may seem disheartening, major companies like Apple, Google, and Microsoft are actively working to promote increases diversity in companies, as they recognize that the majority of workers in technology are white males. Studies show that hiring women in IT roles is beneficial to businesses, as tech companies with women in leadership positions have a 34% higher return on investment than their counterparts. This, coupled with the fact that 35% of young people interested in STEM (Science, Technology, Engineering, and Math) careers are girls, with that number growing increasingly each year, shows that there is hope for more women being a part of the future of technology. 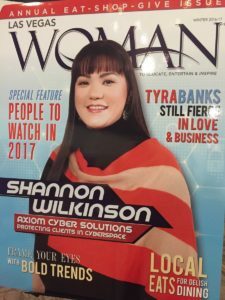 Axiom Cyber Solutions President, Shannon Wilkinson, is featured on the cover of the latest issue of Las Vegas Woman Magazine as being a woman of importance in the Las Vegas community, as a business owner, woman in IT, and as an example of a successful woman (read the full cover story here). In honor of her being both featured on the cover of Las Vegas Woman, as well as being an influential woman in IT, we decided to delve a little deeper into her experience in the technology world, what has aided in her success, and what she has to say to women with a similar career goal in mind. How did you get into the IT field? Do you find that you are treated the same as men in the industry? “Both my mom and step-mom (who I just call Mom as well) both have inspired me throughout my childhood and adult life. By watching them dedicate their lives to their careers, I gained a respect for hard-work and witnessed the power of confidence in self. It is through seeing them be successful in life that I learned that there is nothing that can hold me back except myself. I had to believe in me before anyone else would. What advice do you have to young women considering a career in an IT-related field? As you can see, Shannon Wilkinson and women such as herself can do anything they set their minds to, both within the IT world and beyond. Though statistics on women in technology may be intimidating, it is clear that with the right attitude, determination, and perseverance, your gender nor any other factor will stand in the way of your success. If you’re interested in learning more about cybersecurity and what it takes to be in the field, please visit https://www.axiomcyber.com/. The Internet of Things, a network of physical devices embedded with technology that enables them to collect and exchange data via the Internet, is one of technology’s most incredible advancements because it has been able to bring together millions of ‘smart devices’ in order to help us with things in our daily lives through items such as kitchen appliances, cameras, and cars. However, like many things that are connected to the Internet, these devices can have their helpful technology used for evil. IoT has been the vehicle for many cyber-crimes such as data breaches and ransomware, but more recently, IoT has been in the news for having fueled multiple distributed denial of service (DDoS) attacks. A DDoS attack occurs when an Internet circuit is flooded with so much Internet traffic, referred to as “packets,” that the Internet becomes jammed and then stops, similar to traffic build-up on a busy interstate that eventually leads to a bumper-to-bumper standstill. Though this is usually done by a cyber-criminal taking over compromised computers referred to as “zombies” which are then used to send ‘bad traffic’ to the victim’s site, there is a new wave of this type of attack being fueled by IoT devices. 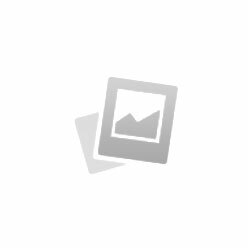 One of the most noteworthy of these IoT DDoS attacks affected Domain Name System (DNS) provider, Dyn. On Friday, October 21st, Dyn, the DNS provider for major websites including Twitter, Netflix, Reddit, and Spotify, was attacked by one of the largest DDoS attacks to date. This takedown was facilitated by hundreds of thousands of hacked IoT devices from Web cams to routers. Similar to a common DDoS attack, once hijacked, these Internet-enabled devices are mobilized together to target all of their Web page requests at one target, in this case, it happened to be Dyn. This caused chaos and outrage on the Internet primarily because the websites it impacted, like Twitter and Reddit, have a massive amount of daily users. Though this is the most widely-known IoT-fueled DDoS attack so far, these attacks continue to occur at an alarming rate. As recent as this morning, there have been reports on at least five Russian banks being hit by IoT-enabled DDoS attacks. 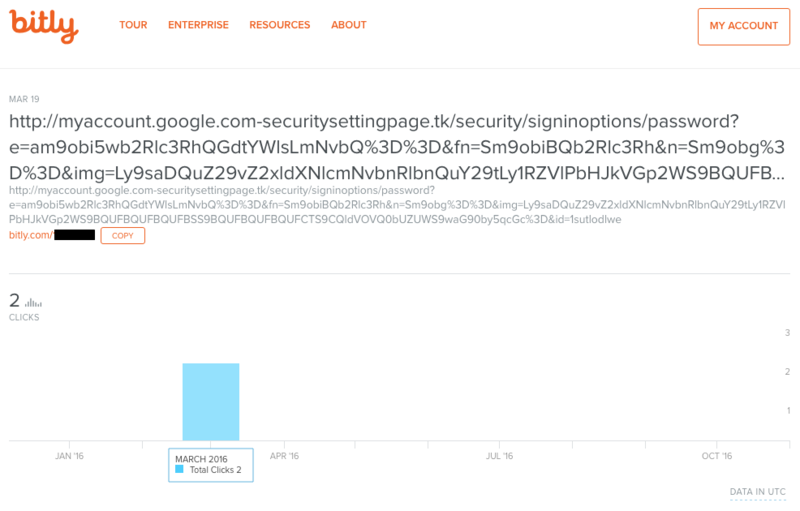 Similar to the Dyn attack, unsecured IoT devices were used without owner knowledge and then colonized to target these banks and their websites. Kaspersky Lab has come out to say that the main cause of this attack was due to the fact that many of these devices were left with their default passwords, meaning that once a hacker got into one standard device, he gained access to all of them. This and a few other simple security steps could help us to be better protected against IoT-fueled DDoS attacks. Turn off remote access to your devices when not in use, if possible–When at all possible, turn off remote access to your IoT devices. By leaving a device active while not in use leaves it extremely vulnerable to use in an attack similar to that against Dyn DNS. Change all device passwords from the default–As mentioned above about the recent Russian bank attack, this is another simple step that can be taken in order to make it that much harder for attackers to gain access to your devices. Change your passwords to something hard to guess rather than leaving them vulnerable by using the same, basic passwords that came installed on your devices when you bought them. This is likely the same password used on similar devices, and using such passwords make these devices easier to hack. Update your systems early and often–Stay on top of your system updates so that your network is well-protected. Activate fully automatic updates if it is hard for you to remember to update frequently, this way, you will never be behind in securing your devices. Axiom Cyber Solutions has been selected as one of the 20 Most Promising DDoS Solutions of 2016 for being able to mitigate the most amount of DDoS attack in a single 1U appliance by CIOReview Magazine. To learn more about our DDoS mitigation services and how you can secure your business by staying ahead of cyber-attacks, please contact us at https://www.axiomcyber.com or by phone at 1 (800) 519-5070 today! No matter which side you might fall on, we all can agree that this has been by far one of the most interesting political seasons to say the least. 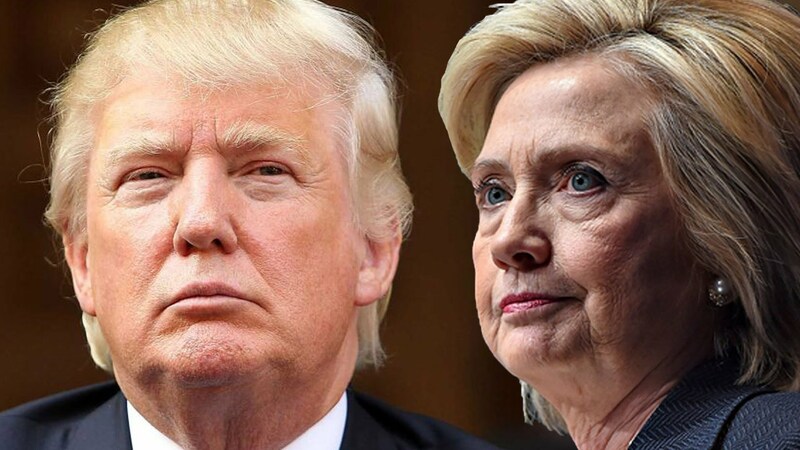 As chaotic and controversial as this election has been though, it is all finally dwindling down next Tuesday, November 8th, as we will finally find out who will be our next President of the United States. 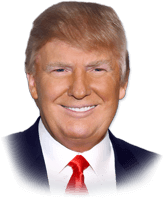 This election is one of the most important yet and it will surely go down in history as one that has been the basis for many discussions and disputes in the homes of Americans. Among the many issues discussed, cybersecurity has been a major talking point at many of this year’s debates and campaign rallies. Millennials have even weighed in saying that a candidate’s position on cybersecurity is an important issue to them. Being a technology-related topic, this is one of the newer issues that candidates must weigh in on that has not been involved in many previous elections. Because of this, many people may have questions surrounding this topic. To help answer some of these questions, below is more information on each of the candidates’ views on cybersecurity as well as their plans of attack, should they be elected. Promote cybersecurity by building upon the U.S. Cybersecurity National Action Plan and upgrading government-wide cybersecurity. Safeguard the free flow of information across borders to find alignment in national data privacy laws and protect data flows between countries. Protect online privacy and security through bringing together cybersecurity and public safety communities to work together on solutions that address law enforcement needs while preserving individual privacy and security. Order an immediate review of all U.S. cyber defenses and vulnerabilities by a Cyber Review Team of individuals from the military, law enforcement, and the private sector and have this Review Team provide specific recommendations for safeguarding different entities with the best defense technologies tailored to the likely threats. Establish detailed protocols and mandatory cyber awareness training for all government employees while remaining current on various cyber-attacks. Develop the offensive cyber capabilities needed to deter attacks by state and non-state actors and, if necessary, to respond appropriately to attack. The third party candidates also competing to become POTUS this year include Libertarian candidate, Gary Johnson, and Green party candidate, Jill Stein. 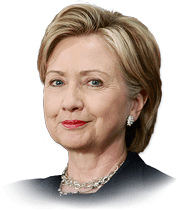 Though the two have not participated in the televised Presidential debates, they each have a stance on cybersecurity. Johnson claims that he would have as little federal government control on the Internet as possible, having “criticized the Patriot Act and cybersecurity legislation for allowing the government access into the lives of private citizens.” Jill Stein says that were she elected, she would plan to negotiate an international treaty banning cyberwarfare with the nation’s overall security in mind. 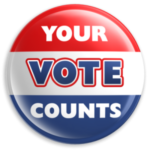 Regardless of your stance in this political race, make sure that you exercise your right to vote! No matter which issues matter most to you, Americans throughout history have fought for us all to have the freedom to participate in this political process, and it is extremely important for each individual to go out and vote in this election in order to have his or her voice heard!